Jennifer Flueckiger is American by birth, Scottish by marriage and currently lives in Paris. She explores travel, cultural exchanges, sport and everyday life in her writing. Jennifer has been published in the anthology Vignettes & Postcards; the Scottish Review; UK literary magazine, Mslexia; and on her blog, the accidental parisienne. In addition to her creative pursuits, Jennifer has helped numerous non-profit organizations and academics tell their stories to governments, specific audiences and the public through a range of publications, events and submissions. She has received praise for her efforts from politicians, academics and organizations. Jennifer is currently working on McSoccer for Girls, a memoir about her experience coaching girl’s soccer in Scotland. She also posts interesting stuff she finds about girl’s soccer around the world on her blog McSoccer for Girls and on the website, Youth Football Scotland. For more information about Jennifer, see http://jenniferflueckiger.com/. Check out Jennifer’s original story, Lil' Izzy, and return here for a chat with the author! 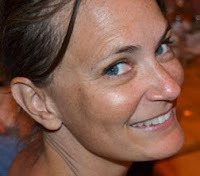 WOW: Hello Jennifer, congratulations on placing in our Winter 2012 Flash Fiction Contest! Lil’ Izzy kept me guessing, which I enjoy, and ended in a bit of a twist. What inspired this story? Jennifer: The inspiration for the story came from a workshop exercise. I was asked to write about a black and white postcard of a young woman in a 1930’s style dress holding a lizard. The woman held the lizard like she might hold a baby. The woman’s dress reminded me of pictures and stories from my grandmother’s Depression-era childhood on a farm on the Ohio River. One story was about the little pig she fed so much it exploded. I remember asking again and again if this really happened and trying to imagine it. Her childhood seemed like a magical place. Then I thought, if pigs could just explode in this place, a woman might be able to give birth to a lizard … Oh dear, it made sense to me at the time. WOW: (laughs) A land where anything is possible—what a perfect place for a writer! What was your process in writing Lil’ Izzy? Jennifer: Once I had the idea about the lizard birth in Appalachia, I just had fun putting down everything I knew about lizards (not much) and playing with the scenario and the language. As I said, it was initially an exercise, but people responded to it so strongly I knew I wanted to develop it further. I wanted the reader to realize slowly that something unusual was happening but there was a danger that it could be confusing. I tested the piece on a few people and their feedback really helped me get the balance right. Jennifer: As a writer, I love words. However, more does not equal better. Flash fiction forces you to make every word count and concentrate what you want to say. Living abroad means you get to know a place and the people who live there a bit more than if you have a short visit. I love hearing people’s stories and how people see the world differently. Their stories and my experiences inspire quite a lot of my work. Being far from home also has the impact of making me really appreciate American stories and storytelling. Lil’ Izzy is an American story told in an American voice. WOW: Great job on the voice—especially considering you’ve been out of the states for so long! Jennifer: At this precise moment, I am trying to figure out the details of moving my writing life from Paris back to Edinburgh, Scotland in a few weeks, e.g., deciding the future of my Paris blog (theaccidentalparisienne.wordpress.com), finding contacts in the UK, etc. However, my big project is a book about my experience coaching U10 girl’s soccer in Scotland. The girls and I had to battle against sexism, sectarianism, and a macho “football” culture, and that was before we touched a ball. Along with this, I write a blog, McSoccer for Girls, where I post good stuff I find about girls and women’s soccer around the world. WOW: It’s sad to think this may be the end of The Accidental Parisienne but we wish you all the best in Edinburgh and look forward to your coming book! Love Edinburgh! Just had to say that. Congratulations, Jennifer. Best of luck with the move.